The most exciting way to see the wonders of Northern Cyprus. 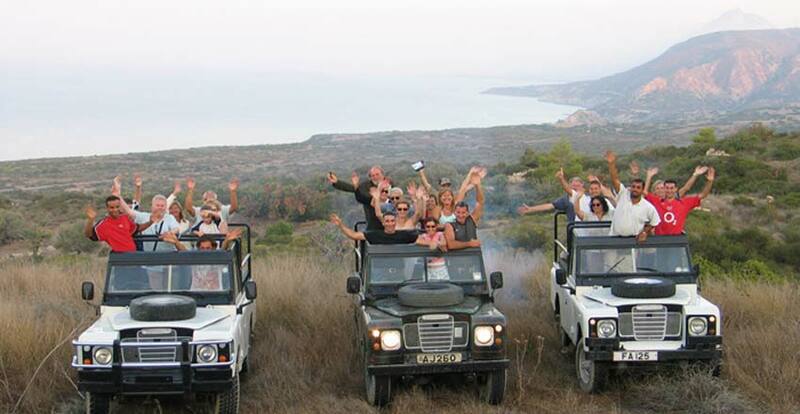 Cyprus Island Safari invites you to join in the excitement of riding in one of our fleet of newly converted open-topped 4wd land rover jeeps. We promise you an action packed day that will give you an insight on Cypriot life and is guaranteed to give you plenty of unforgettable memories. Your tour starts in the picturesque village of Alsancak, some 15 minutes drive west of Girne town centre. We first drive to the top of the pretty white - washed traditional village of Lapta and follow a gravel road that meanders up the 1500 foot high Kyrenia Mountains. 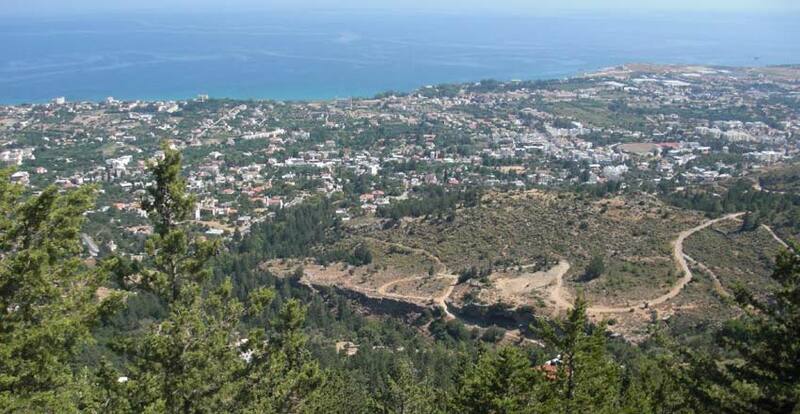 The magnificent panoramic views from the top of the Kyrenia mountain range are stunning and not to be missed. Wonderful views to the sea are visible to the north side of the mountains and the plains to Nicosia and the troodos mountain range to the South. Frequent photo stops will give you the opportunity to capture your own images of these stunning vistas. Your journey will take you along a picturesque mountain road. You will be one of a select few to be shown the much vaunted location of an abandoned Turkish Tank. It lies just below the road where it came to rest after slipping off during the 1974 conflict. The lucky occupants finished up just feet from a very long drop. We will make a brief stop here for photographs. We continue climbing and stop for refreshments at the summit of one of the peaks in the mountain range.. You can take a gentle stroll to see and enjoy the views or hike up a more challenging walk where your reward is to see an unforgettable panorama of both sides of the Kyrenia Mountains. You will also get the chance to be photographed with the Old man of Kyrenia and his much loved donkey and if you're small enough he may even give you a ride!! We return to the jeeps for a short drive to visit a local Village Bakery. Here they produce delicious bread of many different varieties including olive and cheese. They are well known for their wonderful cheese & onion savories. Here you will surely be tempted to sample these wonderful home baked products and to purchase some locally produced honey, olive oil, carob oil and of course the wonderful bread. The charming Monastary at ??? We drive off-road down the south side of the mountains for some 7 miles, to eventually emerge near the famous turquoise Lake. Here we stop for a traditional Cypriot BBQ lunch which can be accompanied by an ice-cold Efes beer. If you're feeling energetic you can work up an appetite by enjoying a walk around the lake while the food is being prepared . Alternatively you can rest and enjoy being in the breathtaking surroundings. After lunch, we continue on the roads for approximately an hour towards the village of kayalar. We detour to visit 'the blue House'. Built in 1957 it has with an original state of the art air-conditioning system, it was the former home of Bishop Makarios's lawyer. He was reputed to have been an arms dealer and His luxurious home was visited by many famous stars of the 50's and 60's including Sofia Loren who was said to have bathed in milk there.. The tour of the house takes approximately one hour. We head back along the dramatic coast road through the village of kayalar before returning to Alsancak at around 5pm where you will be driven back to your hotel. 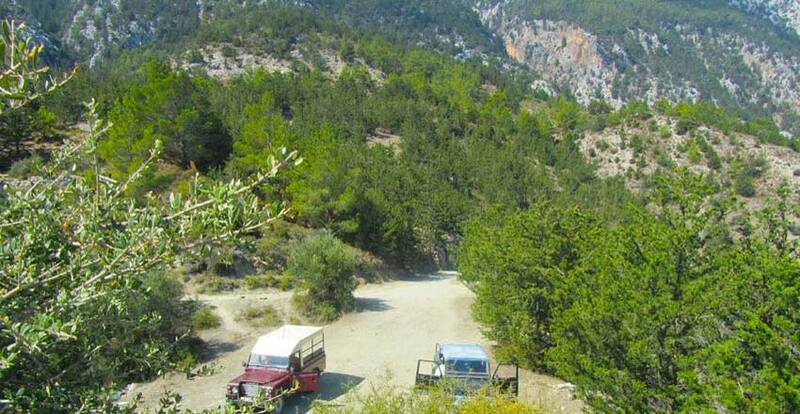 Jeep Safari Tour Price: 40 GBP per person - including lunch. Water is available to buy on Jeep. Always have an extra supply of water! 25 People Maximum per tour.